Remote Monitoring and Tracking company gplink bills itself as the most capable remote diagnostic tool available for high horsepower systems. 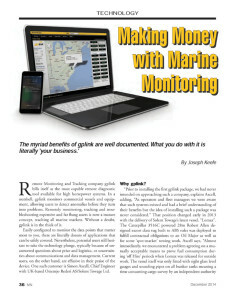 In a nutshell, gplink monitors commercial vessels and equipment, allowing users to detect anomalies before they turn into problems. Remotely monitoring, tracking and troubleshooting expensive and far flung assets is now a mature concept, reaching all marine markets. Without a doubt, gplink is in the thick of it.